You are currently browsing the archive for the Historic Games category. From the drawing provided in the patent application, you could make a pretty authentic board. Here’s the link. It will open in 2012. It will be 6000 sq ft. The two project leads presented during a session called “How the Smithsonian is Embracing Games”– and they are. I remember how wound up people got about Fonzie’s jacket. Plans include a video game festival on the national mall. Think the Obamas will go? Of course they will. I hope Joe Lieberman goes and gets yelled at. 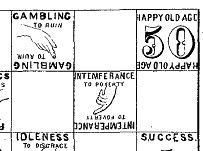 So, I’m reading A Gamut of Games (Sid Sackson), and it mentions in passing that thousands of board games were patented in the late 1800’s and early 1900’s. As Mr Sackson noted, many of these games stink, are racist, or are about baseball. Also, these are legal documents, so making the rules clear is not their primary goal. Gamut includes “Blue and Grey”, a nice checkers variant, that Mr. Sackson found in a patent search, in the seventies. He lived in NYC, so he had access to the patent library via the public library there. They were probably on microfilm reels– here’s the process: look through the (30-pound book of) title lists and keywords, jotting down reel reference numbers, then check out (one at a time) reels with possible matches, then use a Xerox kinda thing to get prints of good ones ($.15 a page), then go home and figure out that they’re all crappy games– repeat twice a week for your whole life, get 20 games. The graphic from this post is from a 1902 patent awarded to L. B. Gaylor. The age of original documents is upon us. When I was in school, you acquired expertise in an area by finding books that anthologized the best books in the field. Usually, the books you found did a their jobs poorly, or only in service to the editor’s agenda, or were limited by the editors’ own poor document access. Now, most original documents are available to everyone with a computer. That’s not everyone, but it’s a billion more than it was. Usually, it’s via Google, and that will eventually be a problem. This book, and all these patents, and all their games, belong to everyone– they are in the public domain. All we need to do is find them. I intend to find a lot of them. As part of my “History and Theory of Games” class, I have students learn and play old games. 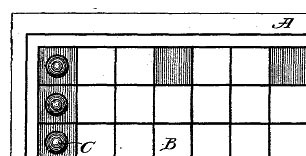 The oldest document that gives the rules to Morris is dated 1414 (according to Murray’s History of Board Games other than Chess), but the board’s pattern goes back to classic times.